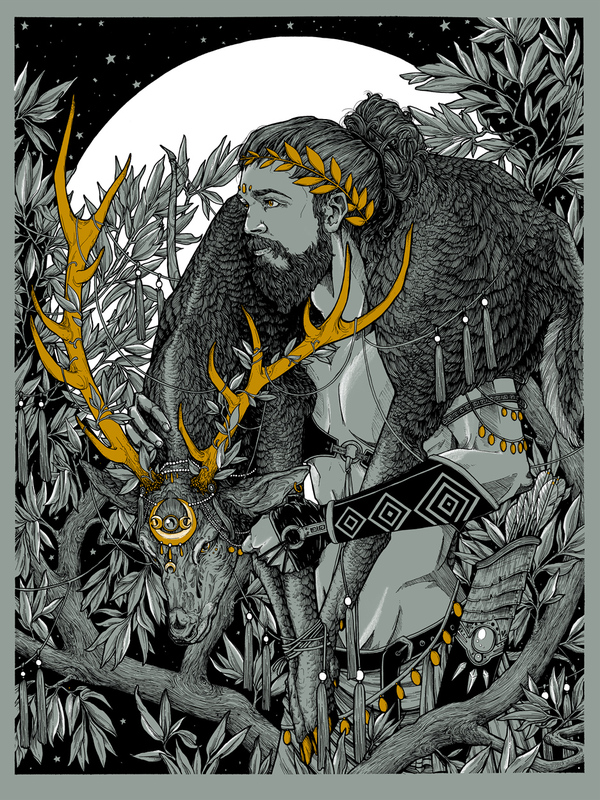 Three color screen print for “The Labours of Hercules” at Bottleneck Gallery presented by FAMP Art. The show featured work from twelve artists who each took on subject matter from one of the twelve Labours of Hercules in traditional mythology. My labor, the second, features Hercules being tasked with hunting and bringing the goddess Diane’s favored stag, known as the Hind of Cerynria, to the gods. Knowing the stag was favored by Diane and not wanting to hurt it and incur her wrath he spent days tracking the deer before finally capturing it, unharmed, and delivering it to the gods without angering Diane. The print is on Steel Grey French Paper and has metallic gold ink.